Every year around this time there is a tradition as old as lighting the candles or trimming the tree: harping about Golden Globe snubs. It’s like complaining about the Emmys, only with the Golden Globes there’s a guarantee that at least some of our favorite stars will be drunk at the show. Or at the very least they will be offended by host Ricky Gervais. 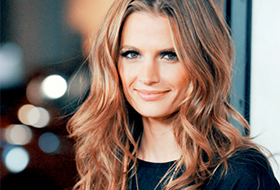 So let me pre-register my complaint: Castle‘s Stana Katic should be nominated this year. Why Stana Katic and why this year? Well first let’s cover what sets this year apart from the others. If you had suggested that Stana Katic had deserved some love from the Globes a few seasons ago, I might have only tepidly agreed. After all, while Katic was a sturdy, reliable performer, she was often merely the straight man to Nathan Fillion’s more comedic and flamboyant Castle. It’s not that Katic wasn’t good in her role — it’s that Kate Beckett was still coming into her own. She had a few episodes that really showcased her range, but for the most part she was dropping crime exposition and setting up sexual tension with Fillion. This year, however, is a whole different beast. Stana Katic’s role has gotten increasingly meatier and she no longer feels like the female sidekick in the Nathan Fillion show. Castle might be named after Fillion’s crime author, but this season it’s Katic’s tough policewoman Beckett carrying the weighty emotional story-arc. Starting from a re-emergent obsession with her mother’s death during the third season and continuing on with the fallout from her shooting, Katic’s excellence has been uniform throughout. Watching the layers of tough, steely Kate Beckett unravel has been a delight. Scenes with her therapist have explored the emotional toll of being shot by a sniper and hearing those three little words from Castle. The show is finally ready to deal head-on with what lies beneath Beckett’s tough, no-nonsense exterior and that’s given Stana Katic a lot of material to play. In every instance Katic has risen to the challenge, making Beckett a three-dimensional character whose flaws are as lived-in and real as her virtues. This brings us to “Kill Shot”, the episode where a sharp-shooting killer unravels Beckett completely. Katic brought both strength and desperation to her performance. As Beckett desperately tried to keep it together, the traumatic memories of her own shooting threatened to overwhelm her. Katic was perfect in her depiction of helplessness and rage, and even better when Beckett came to accept what had happened to her. It was a show-stopping performance. It should also be noted that although it’s her standout dramatic performances that make her worthy of a Globe nomination this year, she is an excellent comedic actress as well. Castle fans love the show for its sense of humor, and the delightful back-and-forth between Castle and Beckett is a big part of the show’s well-developed lighter side. So what are Stana Katic’s chances at getting a little something Golden on her mantle? Sadly, my guess is that her chances are very slim. 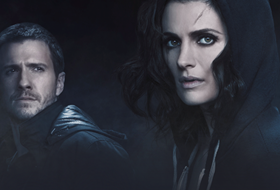 Despite a strong year, Castle isn’t viewed as a very serious drama, and serious, award-bait cable shows have been scooping up all the awards. Plus, this year Katic will have to compete with the tough-as-nails women of Westeros as Game of Thrones smashes onto the scene. Still, the awards always love a good hard-nosed crime fighter. Law and Order: SVU‘s Mariska Hargitay has been nominated for a Globe twice and won once. Award shows love the familiar Law & Order brand, maybe this year they’ll want to nominate another tough-but-vulnerable female detective? As for me, I’ll be pulling for Stana Katic’s name to appear among the list of nominees on Thursday. But I won’t be surprised if I don’t see her there, and that’s a shame.